This tour will take place from Sunday 21st - Thursday 25th April 2019. Guadix, well off the beaten path, the most interesting feature of this area is that many of the inhabitants still live underground in Cave Houses, "Barrio Troglodyte". Desierto Tabernas, Europes only desert and the backdrop for the famous "Spaghetti Western" movies, including "The Good, the Bad & the Ugly" and "A Fistfull of Dollars" , the list goes on! Cabo de Gata-Níjar Natural Park, characterised by its huge volcanic rock formations, some of the oldest geological features found in Europe and Andalucia's largest protected costal area. La Contraviesa, mountain range well known for its Vineyards and Bodegas. Little has changed here over the centuries, many of the vinyards still use mule or ox to pull the plough and the horse and mule still provide the transport from the land to the Bodegas. Arrive at Malaga (AGP) Airport, where you will be met by one of our staff and transported to the guesthouse in Velez De Benaudalla. After the administration there will be a short safety briefing followed by an introduction to your Enfield. The remainder of the day is yours to do as you please and will be an ideal time to get to know the rest of the members of your tour group. There is also a good choice of restaurants and tapas bars in the village, some offering their menus in English. After having breakfast, your tour will begin. Leaving the guesthouse around 9:00 we start making our way east through the lower Alpujaras before turning north through Laroles, Puerto De La Ragua and onto Guadix. The most interesting feature of this area is that many of the inhabitants are still living in caves, tonight we shall experience "Barrio Troglodyte". 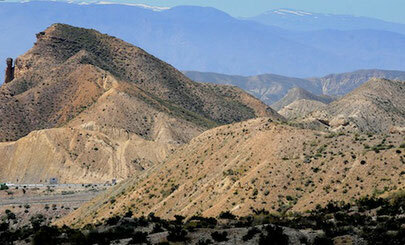 This morning, we'll set off East towards Almeria and "Diserto Tabernas" (Europes only desert). For over 70 years this enigmatic landscape has provided the backdrops for dozens of legendary films and hundreds of famous actors have also left their footprints here including Sean Connery & Clint Eastwood. 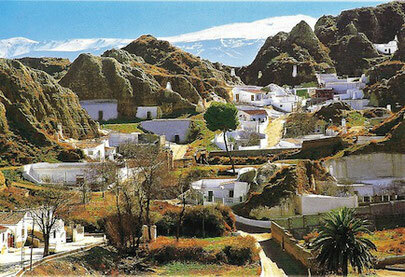 Continuing South, we'll enter Cabo de Gata Natural park, tonight we stay in the coastal village of San Jose. Today will see us head west through Andarax Valley, past Sierra de Cador and into La Contraviesa (one of the major wine producing areas of Andalucia). This is one our our favourite routes, passing through kms of sweeping bends before finally making our way back to our headquarters in Vélez de Benaudalla, arriving around 18:00. You are leaving today, and will be transported back to the airport for your departure flight home. Hopefully, you will have had an unforgettable experience, one that has enriched your soul and left you with a totally different impression of Spain. 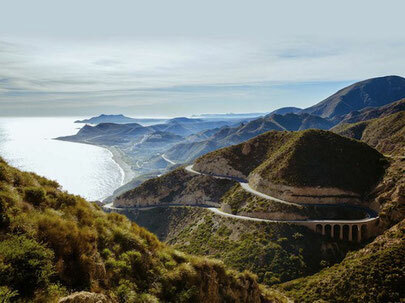 Getting to Malaga International Airport is easy with regular flights from many European cities. We will be offering one airport transfer on the day of arrival and departure. The recommended arrival date for this tour is Sunday 21st April 2019. Please allow enough time for administration, bike allocation and commissioning. We will be covering a distance of around 200 kms per day and spending an average of seven hours in the saddle. The total cost of this tour will be 940€ per person and is based on four riders sharing two rooms. A deposit of 300€ is required to secure your place on this tour, the remainder of the balance can be paid on arrival at our guesthouse. The cost will include, airport transfers, four nights shared accommodation, motorcycle rental with third party liability insurance and fuel. If you would like to have a private room for the duration of your tour, there will be a single room suplement of 150€ added onto the price. Flights, food and drinks are not included. We also advise anyone interested in participating in this tour, that they arrange travel/medical insurance (we can help you arrange this if needed) through an insurance company in the UK. The cost for 5 days is around £20.